My most recent commission was for a kid’s apron – a personalised one for a special boy who is turning 7 soon. 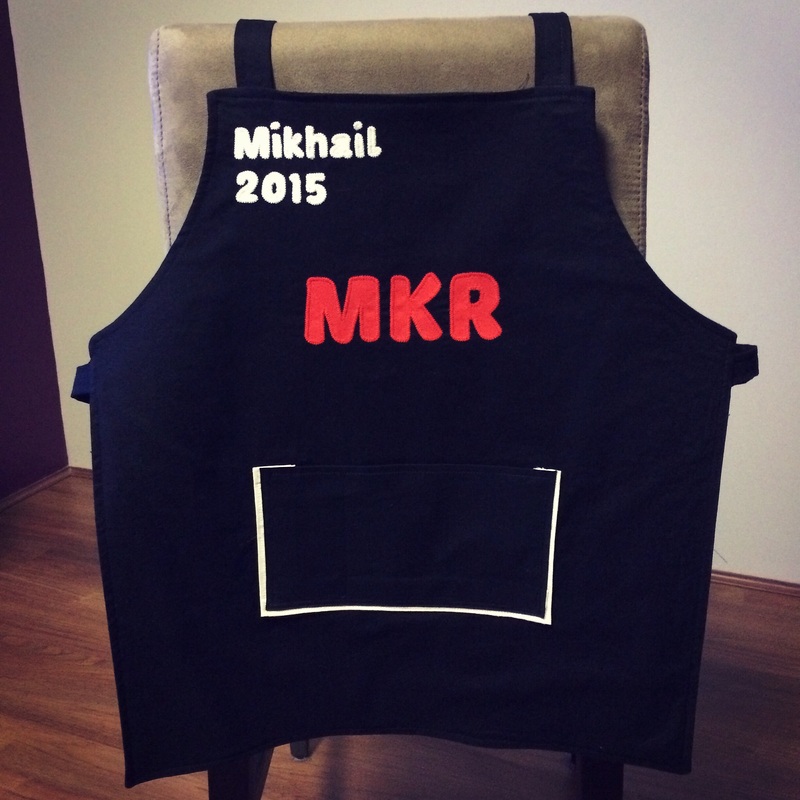 His name is Mikhail and he is a huge fan of an Australian reality TV show called, ‘My Kitchen Rules.’ It’s a cooking show with various teams, all of whom cook at their houses and host a dinner party of sorts for the other competitors. 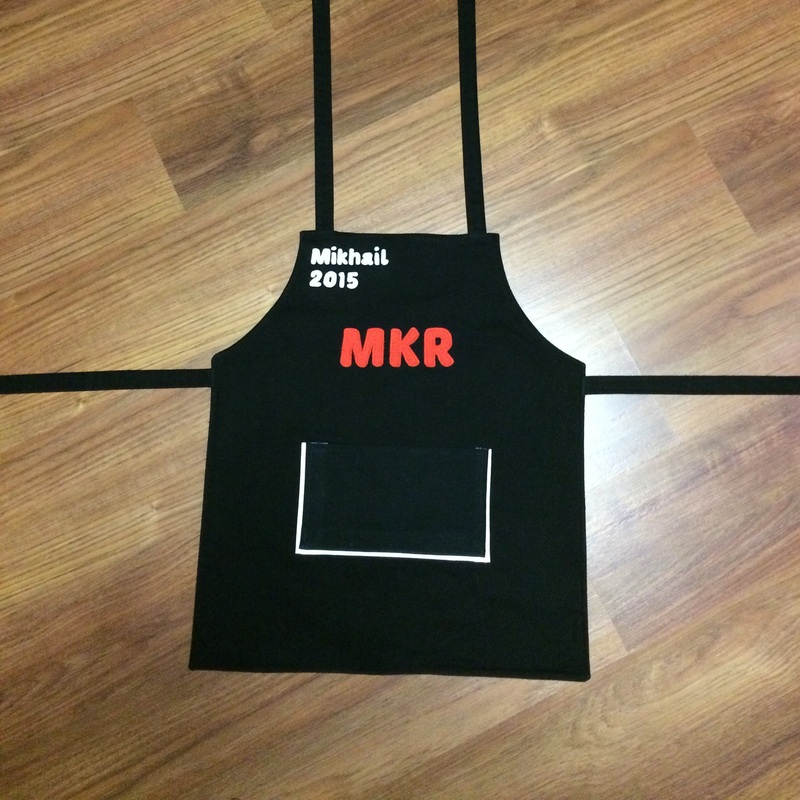 Mikhail’s parents told me that he has a favourite team and hates missing an episode, so they thought it would be a nice idea to have a MKR inspired personalised apron made up for him. I don’t watch the show, but I know what the aprons look like from the adverts I see on TV – have a look here if you’d like to see the original apron. I’ll cut to the chase and show you the end result – it’s like dessert before dinner! ;) If you’d like to see how I made this, I’ve popped a link and some tips below. I used Apron Tutorial as the instruction for this commission, as I’ve never made an apron before. It was so easy to follow, and it’s free (yay!) so I definitely recommend it if you’d like to make one for a youngster in your circle. The pattern is simple enough that you could add some flourishes (I’m thinking ric rac). 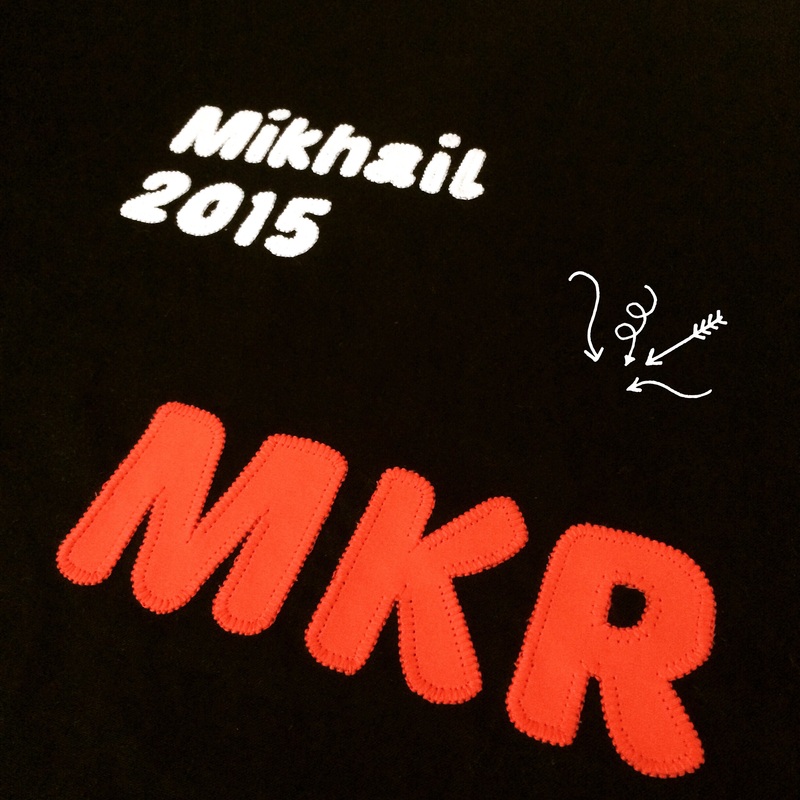 I basically followed it step by step, but added some applique to the top cotton layer in order to personalise this for Mikhail. His parents requested his name and this year be added to the apron. I kept the layout similar to the My Kitchen Rules, but also added pocket to the front. One thing I would recommend if you’d like to stitch this is that you use 1 layer of drill, and 1 layer of cotton. In Australia at least, the aprons are quite heavy and have substances, and when I was buying the black fabric I felt like 2 layers of cotton were too lightweight, and wouldn’t give an authentic apron feel. Then I found some black drill and knew that would work best. Cotton as the front allows you to make the front a really cool, funky style. If you’re lucky like we are though, there are also some really funky drill fabrics out there also. 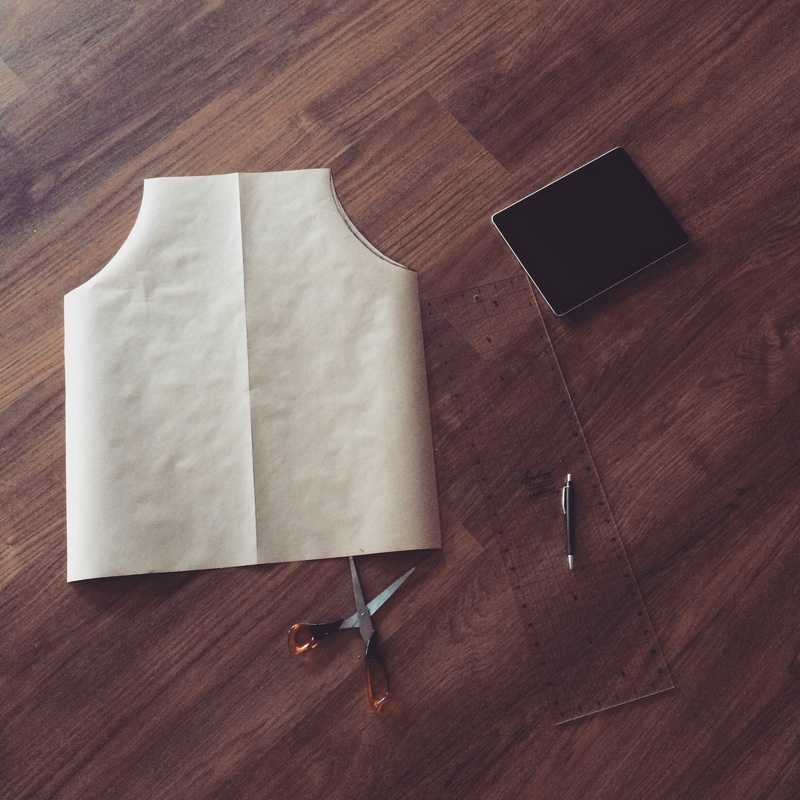 I’m sure if you use 2 layers of cotton your apron will be great – it’s just something I wanted to share in case you want your apron to be a little heavier. The only additional step I took was to pink the edges. I know that the edges are contained once you flip the apron right way out, but no doubt the apron will undergo some washing. I think it’ll be so much easier for Mikhail’s parents to be able to wash this in the washing machine, rather than hand washing. Here’s some photos of the apron coming together. 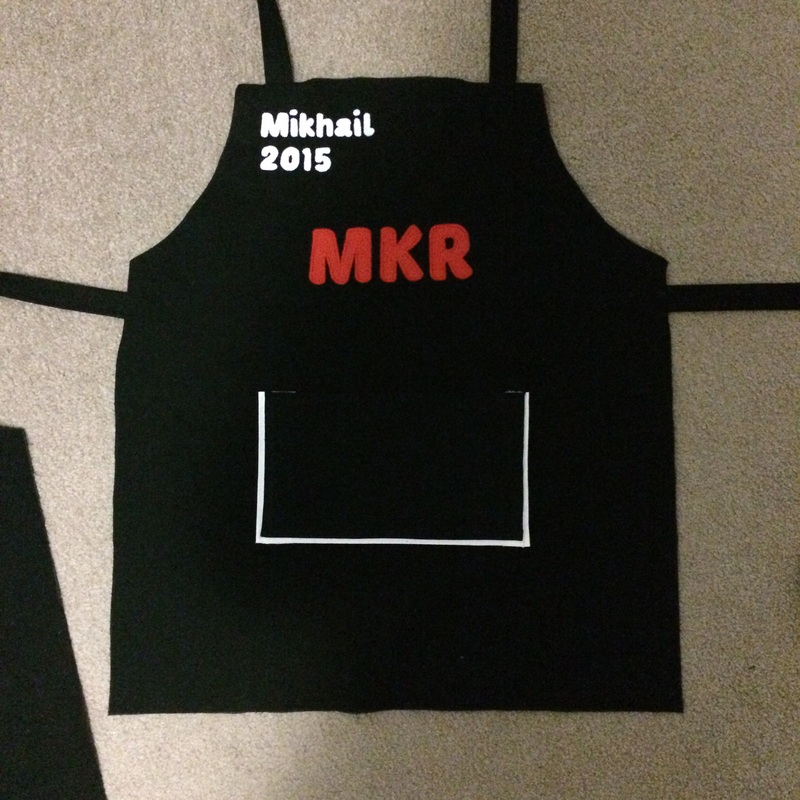 I’m really pleased with how it turned out, and I can’t wait to see Mikhail receive it at his birthday this weekend! nice job!! i was thinking Junior Master Chef.. heehee.. Awesome job! Hopefully he’ll love it! Thanks! He was given it yesterday and LOVES it – mission accomplished! Such a nice gift. I like how you thought about the apron’s likely future (in the washing machine) and made it extra-durable with the pinked edges.